I really like this 5th century map showing the settlement of Germanic tribes throughout the former western Roman empire, you can explain all of the major western nations from it. One of the points oft neglected in the history books is that the ruling elite of most nation states in Europe was german if you go back to when the roman empire fell apart. The Franks (Franci) became the rulers of France, and the French still refer to Germans as the Alaman. The poor old Fresians (Frisi) lost half of the netherlands to the Franks. The Frankish language developed into what we would now refer to as Dutch. The franks who ruled France were assimilated. Louis and Ludwig both derive from the german name Clovis, the name of the first king to unite all the Frankish tribes. 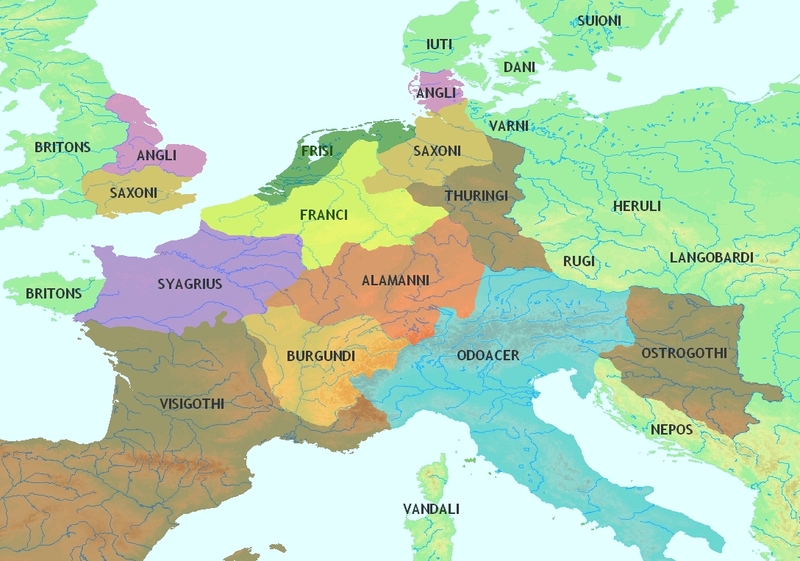 The coloured borders are pretty much where the Germanic people end and the Slavic tribes start. The Germans managed to colonise quite a bit of slavic land in the intermittent centuries, however the russians reset the borders a bit when they single-handedly won world war II. Mitterrand [president of france] recognized before Thatcher that reunification was inevitable and adjusted his views accordingly; unlike her, he was hopeful that participation in a single currency and other European institutions could control a united Germany. Nice try france but thanks the the GFC Germany is having to take the reigns of Europe, to save it!